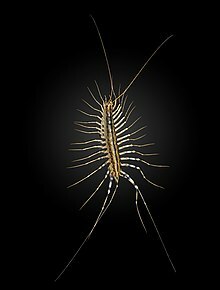 Scutigera coleoptrata, more commonly known as House centipedes, are yellowish grey centipedes having up to 15 pairs of legs. The species are found all across the world and live in human apartments or houses. The house centipede is an insectivore; it kills and eats arachnids and insects. They were first discovered around 1758. These centipedes are harmless to humans, although humans may be startled by them. This page was last changed on 2 September 2017, at 20:06.